A fall in the street, a tackle on the gridiron, a bomb blast on the battlefield—any of these events can result in a concussion, or mild traumatic brain injury (mTBI). We already know mTBIs are common, but, they may be even more common that we realize, given our lack of objective diagnostic measures. 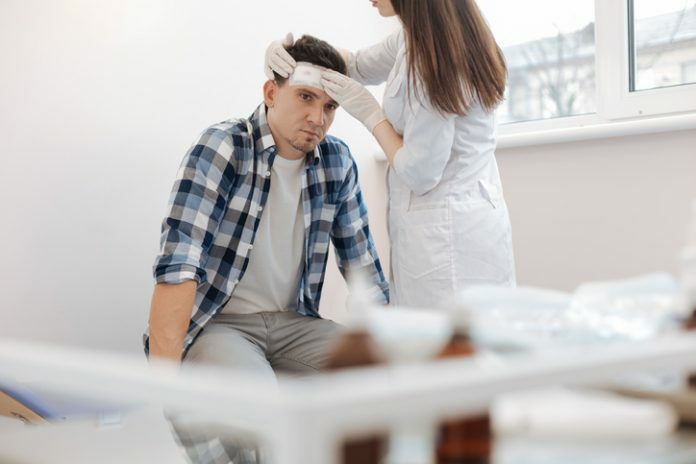 To find a way of detecting and confirming mTBIs more accurately, scientists are looking for mTBI biomarkers, chemical signs that linger, briefly, in our body fluids after concussive impacts. To date, scientists have been looking for blood biomarkers among our circulating proteins. A new study, however, takes a different approach. It suggests that signs of concussion may be found among our circulating metabolites, which may prove easier to track. The new study, which was conducted by researchers from the University of California, Irvine, Georgetown University, and the University of Rochester, reports success with a blood biomarker panel consisting of six metabolites. With this panel, the scientists objectively classified acute mTBI cases from controls within 6 hours of injury. The scientists assessed two independent cohorts, one of which included athletes, injured and uninjured teammates. Details appeared April 20 in the journal PLOS ONE, in an article entitled, “Plasma metabolomic biomarkers accurately classify acute mild traumatic brain injury from controls.” This article indicates that the combined presence of six metabolites accurately predicted whether teammates had sustained an mTBI or not. This finding suggests that these small molecules, and possibly others, might be clinically relevant biomarkers of mTBI. Although the results are encouraging, the authors report limitations to their study and recommend additional investigations related to these and other mTBI biomarkers in blood that will further clarify their utility in clinical management. “Such blood tests are important in determining not only whether someone has sustained a concussion, which is not currently an easy task, but may eventually prove useful in defining when injured individuals may be eligible to safely return to regular activities,” said Massimo S. Fiandaca, M.D., the paper's first author, a retired neurosurgeon and co-director of the Georgetown and UCI research groups led by the paper's senior author, Howard J. Federoff, M.D., Ph.D.
An objective biomarker of mTBI is not yet available to healthcare providers, coaches, and trainers, and military commanders and combat medics. Such a diagnostic test might revolutionize the management of civilian and military concussions, including strategies to avoid post-concussive complications and more severe consequences, such as chronic traumatic encephalopathy. The estimated 40 million individuals worldwide diagnosed with mTBI likely represent a gross underestimation of those actually sustaining such injuries. Clinical practitioners require a relevant and reliable, minimally invasive, objective diagnostic test to determine high versus low probability of mTBI in a timely manner. Dr. Fiandaca said there is a clear need to improve diagnostic capabilities, which could reduce underreporting of mTBI and allow more appropriate care to be delivered to concussed individuals. Falls represent the most common cause associated with mTBI among civilians in the United States and around the world. In the United States, sport-related mTBI produces up to 3.8 million documented injuries per year. Changes in warfare practices in the last two decades have elevated blast injuries to the primary cause for mTBI in the active duty military. Between 2000 and 2016, approximately 82% of all military TBI fell into this category. Although current technologies for defining the discovered small molecules in today's publication lack the rapid, point-of-care platforms being developed for other measures, the study authors anticipate a growing technological momentum to develop such novel platforms resulting from this and similar investigations.